Bow the Knee to Blob! Such simple rendering and yet, such powerful rendering. Remember, most of MC Escher’s great drawings were done in pencil, so there’s no reason why a grayscale or monotone image has to be dull. Just look at the detail in blob’s image, how it’s all over the place in every nook and cranny and has such creative diversity. This is the magic of great software and those who know how to get the most out of it. 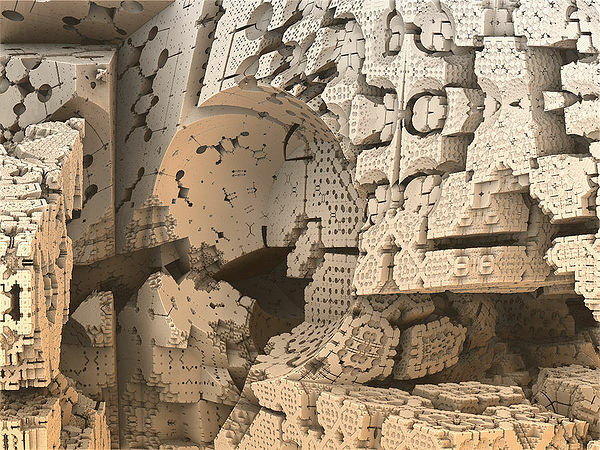 It’s made in Jesse’s Dierks’ free program, Mandelbulb 3D 1.53. The expression, “the proof of the pudding is in the eating” really applies to fractal programs: you can judge them by what users are able to make with them. As you can see here, Jesse’s program is clearly top notch. I’m really surprised that such high quality software continues to be made in the fractal world. I guess the new 3D formulas have inspired programmers like Jesse to create these new things. 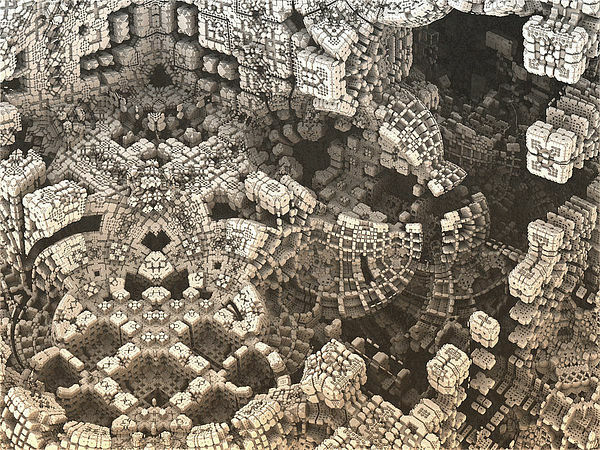 Again, subtle rendering that magnifies the beautiful designs of the hybrid mandelbox/sierpinski formula. The top left corner I find to be the most interesting, next to the large round cavity in the center. Everywhere you look there seems to be something a little different. I’ll bet one could get completely lost exploring this object and forget all about taking snapshots. Makes the Grand Canyon look like a ditch. 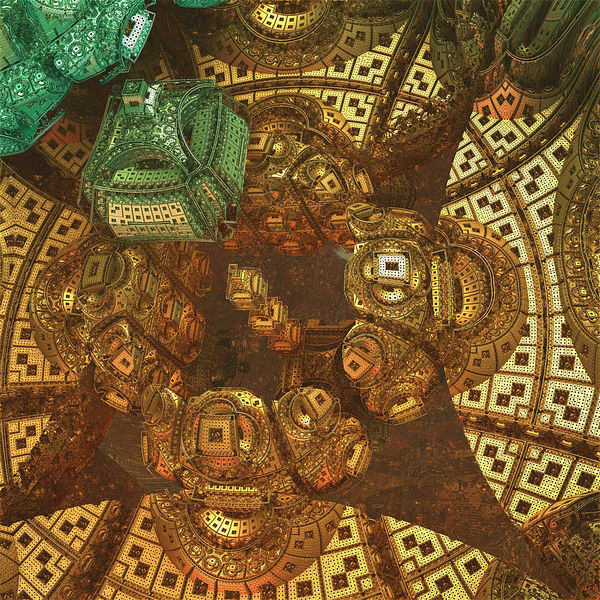 This is no pencil drawing, but the lavish gold and metallic emerald surfaces look good in this mandelbox. Thank you everyone involved in this @ fractalforums, I think the things you all found is bigger than anyone of us can imagine! I think the starry background has been added in, but it sure fits with this extraterrestrial space temple. The coloring is really exceptional. Kraftwerk has a real talent for that. He’s made some of the best colored mandelbulbs I’ve ever seen. 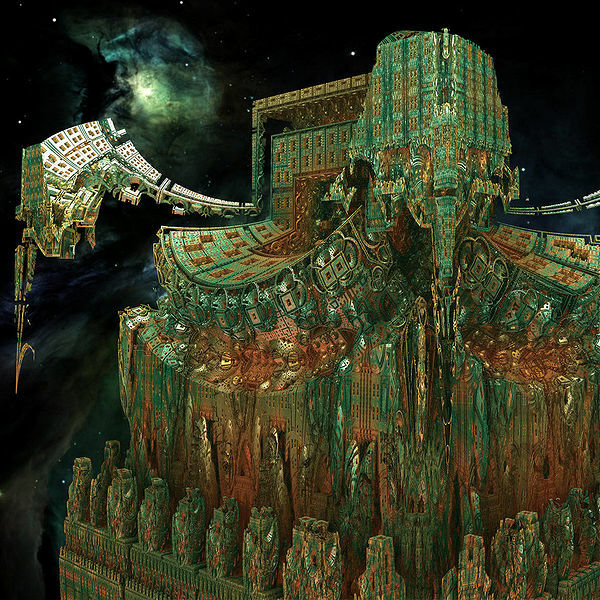 He’s also using Jesse’s Mandelbulb 3D just like blob. I find it quite interesting that both of them can use the same program and get equally good results and yet with such widely varying styles. Fractal programs are bit like musical instruments: it’s not what you play but how you play it. I can’t resist adding YouTube content to my postings. So here’s a recording of the original Kraftwerk music group of “The Voice of Energy” which inspired fractal Kraftwerk’s title for this series of mandelbox images. It’s in German.